Just like humans, brands have their own distinct voices that set them apart from others and establishes their identity. This voice is also their first way of effectively conveying their message to their audience, and eliciting the right responses based on the tone that they use. Brands – and humans – have a distinct combination of tone, intonation, accent, and vocabulary that indicates what sort of image they are portraying. When starting out on your business, your brand voice should be one of the first few factors that you have chosen, developed on, and settled with, because it is one of the foundations where you can build on your brand’s overall impact. This is also the case because developing your brand voice takes a lot of time to develop as it can involve multiple trial-and-error. Developing your brand voice is undergoing tough decision making and understanding on a deep and personal level what your clients and target market would be receptive to. But nowadays, the market is so drowning in so many voices from so many brands that are all vying for their attention. They are learning how to tune out brands that do not have the ability or voice to set themselves apart from the multitude of competition that they have, which is bad news for brands with a voice that isn’t very distinguishable from other brands due to its similarity or lack of uniqueness – in other words, a monotonous voice. When this is the case, many businesses feel the need to change their brand voice from the ground up to hopefully hit the mark on their next try – which can be a huge time-consuming activity to do. Sometimes, all it takes is a little sprucing up of your brand voice to make it more unique, flavored, and suited for the kind of image your brand is going for. Evaluate your existing brand voice – Take a step back and evaluate how your brand voice has sounded like in the past. Find your inspirations – Take cues from other brands whose voice you feel are what you want your brand voice to sound like. Outline your ideal brand voice – You should define a clear voice right from the beginning. Otherwise, you’re going to confuse your audience and drive away customers. Reinforce your brand’s values and beliefs – Let your brand voice reflect what you want to tell your audience. Generate conversations with your audience – Maintain a two-way dialogue with your fans. Spotlight your consumers – Make your fans feel as though they are part of something bigger than a seller-buyer relationship. Know where your brand voice is highlighted the most – Not only is it smart to know your brand voice’s tone, you also increase your influence when it is used through the right channels. Quality over quantity – At the end of the day, it’s important that you aim for your brand voice to have a quality appeal rather than try to get it to click with everyone else. 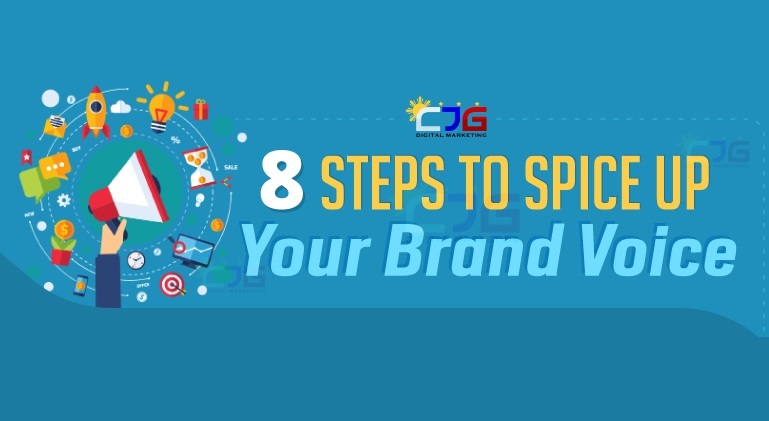 Learn more about these steps and how you can implement them with below Infographic shared by CJG Digital Marketing.